Russian Hill is one of the cutest areas in San Francisco with adorable shops, restaurants, and views. Located there, a quaint restaurant called Stones Throw serves up seasonal fresh Californian cuisine. Like most trendy restaurants in the city, their menu offers bite sized snacks, appetizers, and a few main courses. We opted to get all the snacks and a few appetizers to share since we weren’t that hungry. Local Halibut Tartare with White Soy Vinaigrette, Melons, and Serrano Chili (7/10). Duck Pâté and Mousse with French’s Mustard, Cornichons, and Warm Soft Pretzels (8/10). 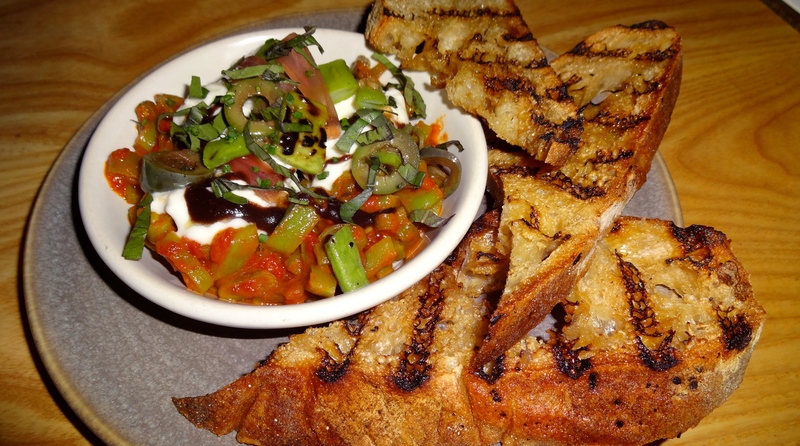 Tomato Braised Romano Beans with Burrata Cheese, Castelvetrano Olives, and Grilled Bread (8.5/10). 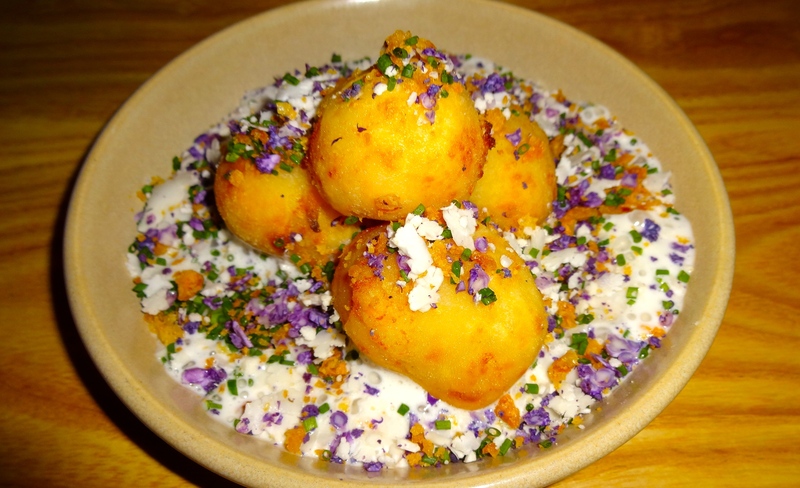 Puffed Potato and Eggs with Cauliflower Mousse, Crispy Chicken Skin, and Chives (8.5/10). Overall all the snacks were pretty tasty. 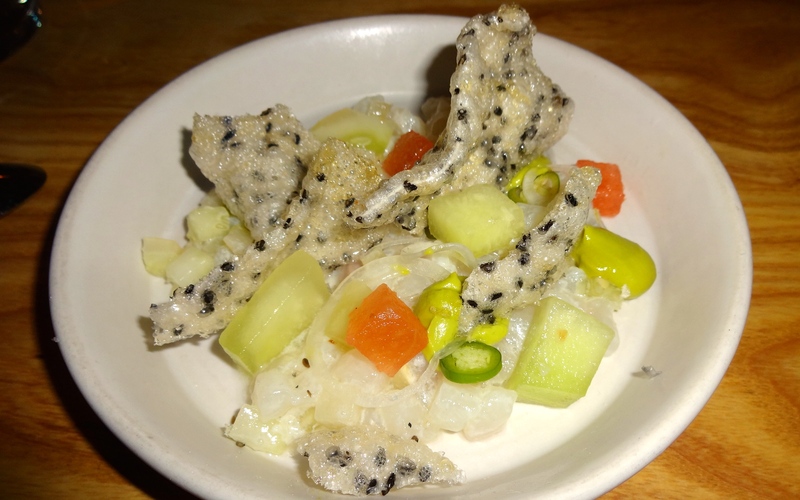 My least favorite snack was the halibut tartare with melon and serrano chili; the dish was good but needed another element to amp up the flavor. 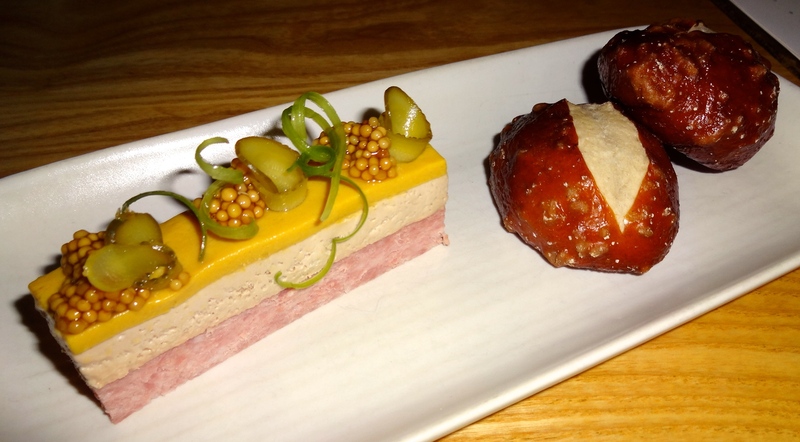 The duck pâté and mousse was beautifully crafted with layers of hearty pâté and creamy mousse with pungent French mustard topped with mustard seeds and cornichons. The warm pretzel rolls were a good accompaniment with the pâté. Next, the grilled bread with tomato braised romano beans was so satisfying for a vegetarian dish. Summer romano beans cooked slowly in a sweet tomato sauce topped with melted Burrata cheese, and briny castelvetrano. Extremely comforting. Lastly, their signature snack of puffed potato and eggs was a winner. Fried but light potato dumplings with a liquefied egg yolk in the middle served with creamy cauliflower sauce and crispy salty chicken skin bits. 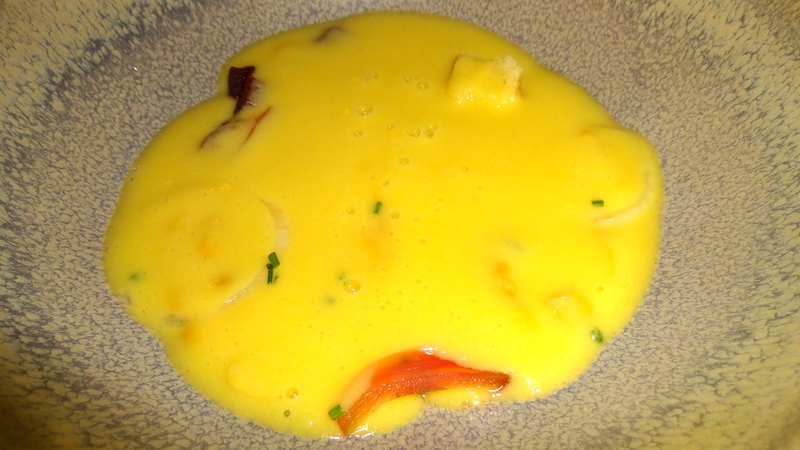 Sweet Corn Soup with Uni Cream, Bacon Lardons, Cornbread, and Spring Onion (7/10). Our first appetizer of sweet corn soup was tasty but not the best corn soup I’ve had. Squid Ink Conchiglie with Spicy Capers, Clams, Calamari, Shrimp, and Greens (8.5/10). 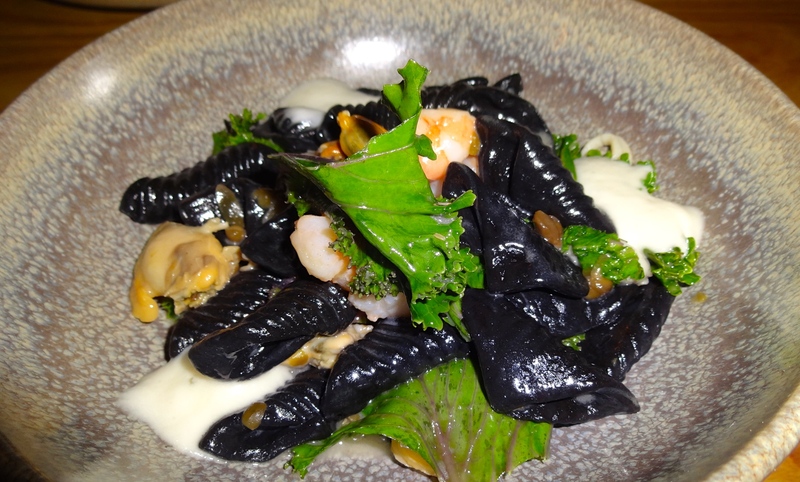 Our next dish, the squid ink conchiglie was a great pasta dish with flavors of the sea. Clams, calamari, and shrimp all tossed with salty capers and vibrant greens made this pasta delicious. Blackberry Crisp with Nectarines and Lime Ice Cream and Peach Sherbet (8/10). Now their dessert menu consisted of their modern takes of childhood favorites. 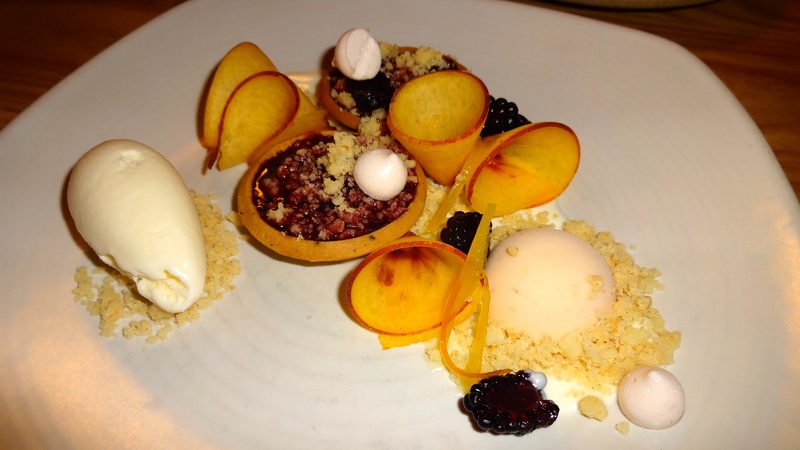 The blackberry crisp was sweet yet slightly tart with fresh nectarine slices, lime ice cream, and peach sherbet. Peanut Butter and Concord Grape Jelly Donuts (8/10). Our last dish was the peanut butter and concord grape jelly donuts. 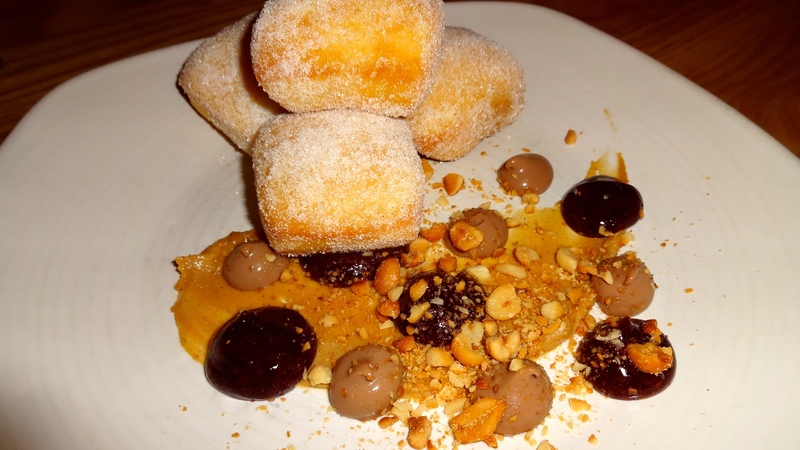 Sugar tossed beignet type donuts with creamy peanut butter and dollops of grape jelly. Yummy! Stones Throw is a cute restaurant with tasty food in one of my favorite neighborhoods in San Francisco so I’d rate them at a 8/10. Pingback: Review: Trestle. | Sale, Pepe, Amore.